Support this site and book your Disney vacation or cruise today with Kristen at http://magicaljourneysvacations.com. The wise sorcerer Yen Sid tells of a wondrous map – one unlike any other – with the power to take dreamers to any place imaginable. But when young apprentice Mickey Mouse attempts to paint the map’s one unfinished spot, he stumbles into a fantastic adventure through worlds of music, color and beloved characters, as he discovers the mystery of the map’s magic! 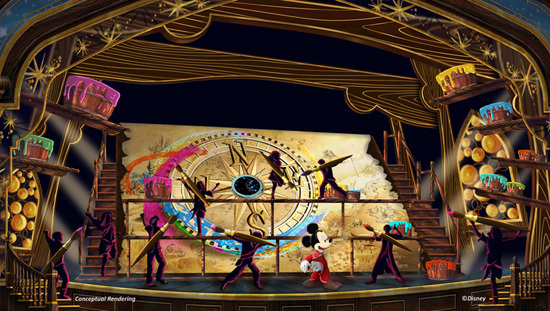 “Mickey and the Magical Map” debuts in summer 2013 at Disneyland park. Book your next Disney vacation or cruise with Kristen Hoetzel of Magical Journeys Travel! Trying to decide on the perfect Orlando, Anaheim or Cruise Vacation? Let Kristen Hoetzel of Magical Journeys Vacation Specialist assist you in selecting the best option to fit your wants, needs, and budget at no cost to you! You will also be supporting this website! Fill out the form and book your Walt Disney World Vacation today! Visit http://magicaljourneysvacations.com. Technology Focus: Is Apple Another Walt Disney? Jedi Mouseketeer is in not affiliated with the Walt Disney Company. Picture Window theme. Powered by Blogger.